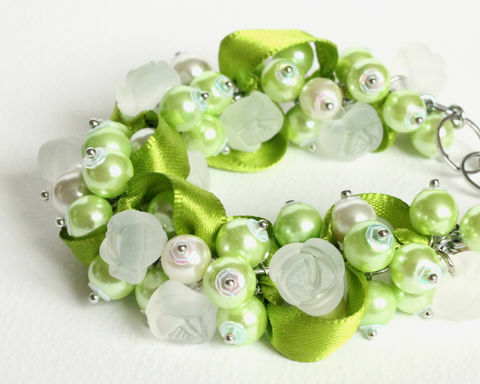 Cluster necklace in white and lime green color. Made of glass pearl beads and matte white plastic flower beads. Suitable for bridesmaid, for prom, banquet, wedding party or any dress-up events. The cluster part of the necklace occupied around 6" of length. The rest is a silver chain intertwined with a matching ribbon. The necklace comes with a lobster clasp that can be wear between 15.5" to 17.5". If you need it shorter or longer, please convo me to have it custom-made. A matching pair of earrings only at USD5 extra.